Aeron-Scalper-Grid-File-B Expert Advisor will handle a position until its age is >= handling_Time. 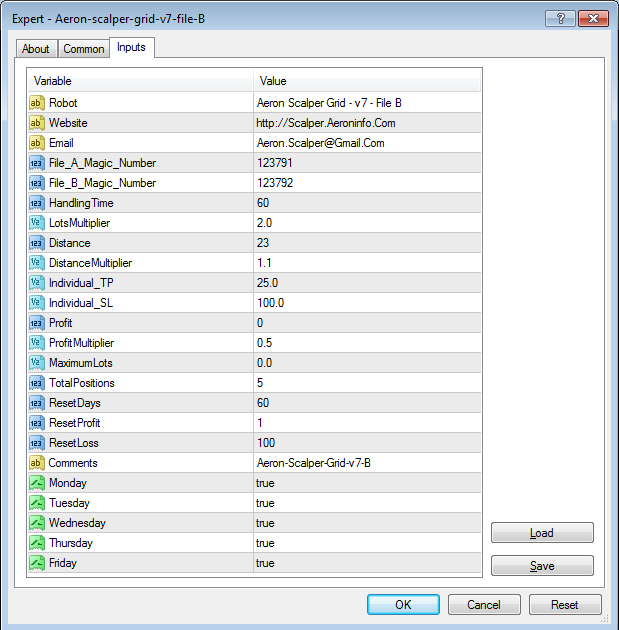 Say if Handling_Time=60, then if a opened position by Aeron-Scalper-Grid-File-A is greater than 60 minutes old then only it will be handle by this Aeron-Scalper-Grid-File-B Expert Advisor. It is the distance in pips between 2 successive positions. If you set it 35, then on 4digit brokers it is 35pips and on 5digit brokers it is automatically as 350 pips. If it is 2, then subsequent positions will open at distance equals to above parameter Distance multiplied by this paramater. Say if EA needs to open second position and Distance=35 then its distance from first position will be calculate as, 35x2=70. This is the Take Profit Pips set to each position opened by File-B. If you set it 25, then on 4digit brokers it is 25pips and on 5digit brokers it is automatically as 250 pips. This is the Stop Loss Pips set to each position opened by File-B. If you set it 100, then on 4digit brokers it is 100pips and on 5digit brokers it is automatically as 1000 pips. If it is 0 then this parameter will be automatically calculated by EA & you can see its value on the chart. This is the value in USD (depends upon your account currency). If there is only one opened position and its profit is equal to this parameter's value, then EA will close this position. Its default value is 1.0. Let us consider its value is 2.0 so now suppose there is only 1 open position in your MT4 then above defined parameter Profit will has its default value. In another scenario if there are 2 open positions by this EA in your MT4 then value of the above Profit parameter will be ProfitX2, similary if there are 3 positions then Profit parameter will be valued to ProfitX2X2. Now when all opened positions cumulatively comes in profit equal to this new Profit value, then EA will close all of them. It is maximum value of Lots size which you can see in your account by the EA. If it is 0.0 then it is automatic calculated and its calculated value can be seen on the chart. It is the total maximum number of buy+sell positions which EA is allowed to open. Here you can specify the number of days. If any trade by EA is being old equivalent to ResetDays then EA will close out all positions and will fresh start. [this is the percentage of account balance] Say ResetProfit=5 so now if all positions by Aeron EA is greater than or equal to AccountBalance X 5 /100 in profit, then EA will close out all positions and will fresh start. [this is the percentage of account balance] Say ResetLoss=20 so now if all positions by Aeron EA is greater than or equal to AccountBalance X 20 /100 in loss, then EA will close out all positions and will fresh start.